I was supposed to do another hike with Mark yesterday but he was called to work so I did another solo. 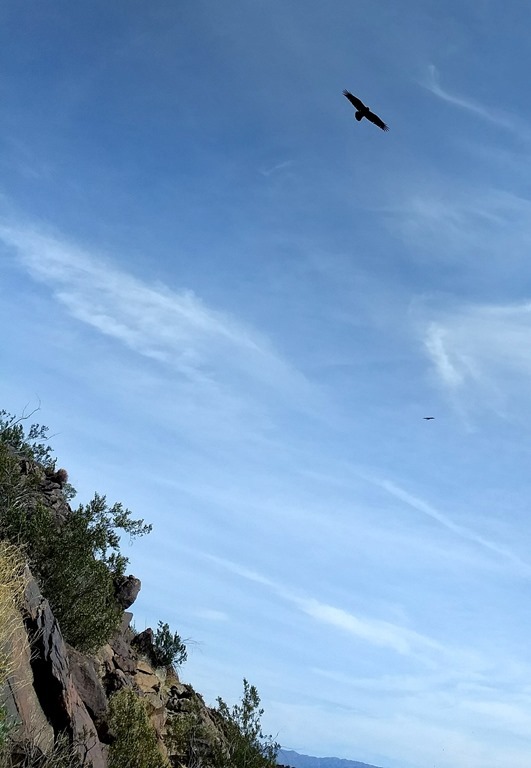 After a little research, I decided to go up the the North Lykken Trail, which started at the end of Ramon Road, and come down the Skyline Trail which terminated at the Palm Springs Museum. These two trails had no semblance of the Araby. Much steeper with many large step-ups (and downs) which require a hand hold on the nearest boulders or some very judicious foot-placing. But there’s more. I missed the correct return route and headed into no man’s land. Given the condition of the trail, I knew this was the path less traveled and double-backed. Of course, it was back up mountain and the sun was rising fast. That was brutal and the vultures were circling. I eventual found the way down and it was not easy. My legs had turned to rubber once again. Arriving on level ground at last, I made a beeline to the museum and the nearest water fountain and luckily, a soft chair was only a step away. I sat there for a good half hour sucking down water and basking in the air-conditioned space but I knew my trip was not yet over. I had to traverse another mile to my car but it was flat and of no consequence. 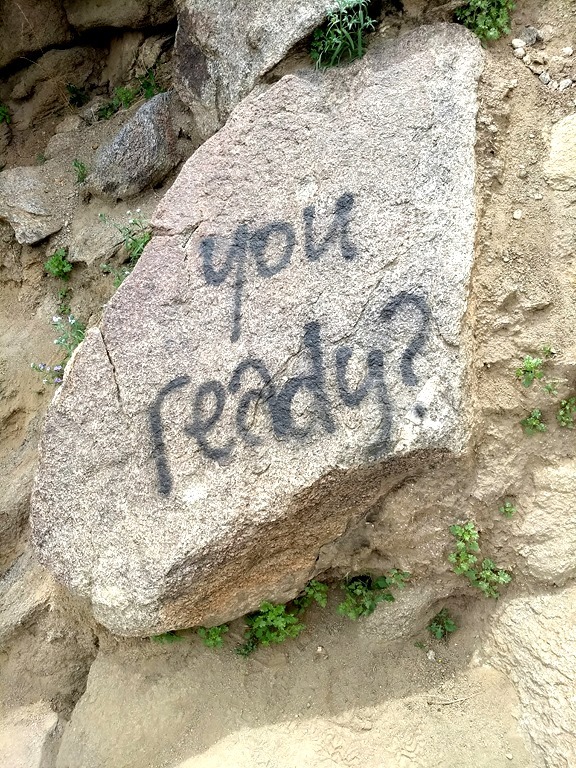 This was on a rock at the end of my trek. I wasn’t. Mark wished to reschedule for today but I passed Need some rest before looking for work in Beaumont on Symetra. My Google Fit app had me walking over over 17,000 steps. Add in the elevation changes, that’s enough for a while. Dave and Rob concocted a huge pot of spaghetti Bolognese on Thursday along with garlic bread and a side dish of bean sprouts with fried egg and onions. I’ve been living on the leftovers the last couple days. Two meals yesterday and one today. Finally gone. Yummy in my tummy. I replaced the vertical blind head rail in Dave’s room this morning. Switched out the clips and reused the slats. Easy-peasy. Check out Dave’s leap into Poppie”s Pond. This entry was posted on Sunday, April 1st, 2018 at 5:11 pm and is filed under Uncategorized. You can follow any responses to this entry through the RSS 2.0 feed. You can leave a response, or trackback from your own site. Larry, I may need to refer to you as “Glutinous Maximus” a glutton for punishment:) I’m sure you are seeing the sights of Palm Springs that don’t appear in the travel brochures.